This spicy dish is ideal for a simple weekday family supper. And with all the ingredients in the same pot, it’s easy on the washing up, too. Heat the olive oil in a large, heavy-based pan and add the onion and carrots. Cover the pan and sweat the vegetables over a low heat for 10 minutes. Remove the vegetables from the pan and set them to one side. Increase the heat slightly, add the chicken strips and cook for a few minutes until golden brown. Stir in the spice mix and cook, stirring, for another minute or so. Add the vegetables back to the pan, then add the tomatoes and the stock. Stir in the chickpeas, season and bring to a simmer for 20 minutes, covered, until the chicken is cooked through and there is no pink meat. 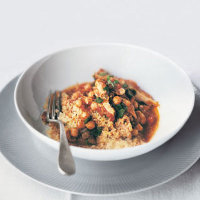 Stir in the coriander, and serve with couscous or crusty bread. If you have some leftover cooked chicken, you could use this instead of raw chicken. Just add the cooked chicken 5 minutes before the end of cooking, until heated through. Rosé is a perfect choice for light, evening suppers. El Prado Tempranillo Rosé 2007, Valencia, Spain, is juicy and berry-scented, with a refreshing acidity that’s ideal for tomato based sauces.